Hopes that puffins on Lundy Island will thrive again have been boosted by news that the island has now been free of rats for more than a year. It is thought the rodents arrived on the island off north Devon about 200 years ago from wrecked ships. Since then they have terrorised the puffin population. However a controversial cull appears to have succeeded and the Royal Society for the Protection of Birds (RSPB) says four puffin burrows are now occupied. The scheme is a joint partnership with English Nature, english Heritage and the Landmark Trust which actually owns Lundy Island. Peter Exley from the RSPB said: "Hopefully by the end of next winter we're going to be able to officially declare the island rat free. 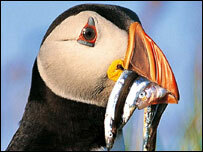 "The puffins are long lived birds - it takes four or five years for them to reach breeding age. "It'll probably be a decade or more before we see a significant increase in puffins and other birds." The society is also very excited about the sighting of a manx shearwater whose only other British nest is on the Isles of Scilly. In the meantime the RSPB is urging visitors to Lundy to be very careful they do not re-introduce rats to the island by accident.